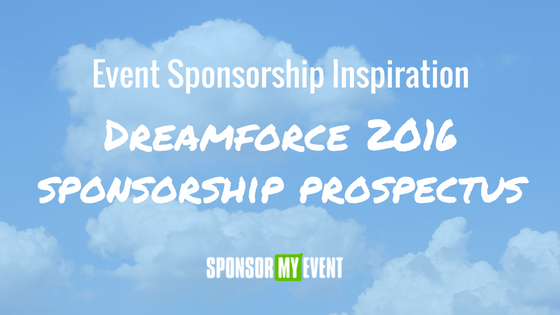 As annual mega-conference and expo Dreamforce wraps in San Francisco this year, we’d like to share a bit of inspiration from the digital side of their event management: the Dreamforce 2016 event sponsorship prospectus. This 41-page .pdf behemoth is something for all #eventprofs to behold: it’s a beautiful document, well-crafted in terms of information flow and the content itself is meticulously written and designed. So, the question is, what can your event borrow from this prospectus? 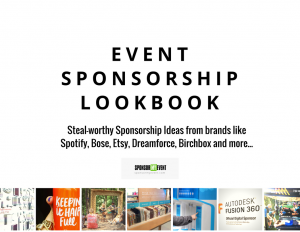 From there, you’re presented with why you’d potentially sponsor DF: meet critical business connections, launch businesses, announce new products, gain major traction, build momentum, accelerate success. It’s all there. The last thing worth mentioning here is that DF presents you with a simple email address to contact to get the ball rolling: partnersuccess@salesforce.com. Way too many prospectus documents fail to provide an easy point of contact at the outset of the prospectus! Demographics, Event Stats, Personas – oh my! The next few pages beautifully illustrate the demographic makeup of the Dreamforce attendee base, pertinent and significant event statistics and even the five personas that represent the majority of Dreamforce attendees. 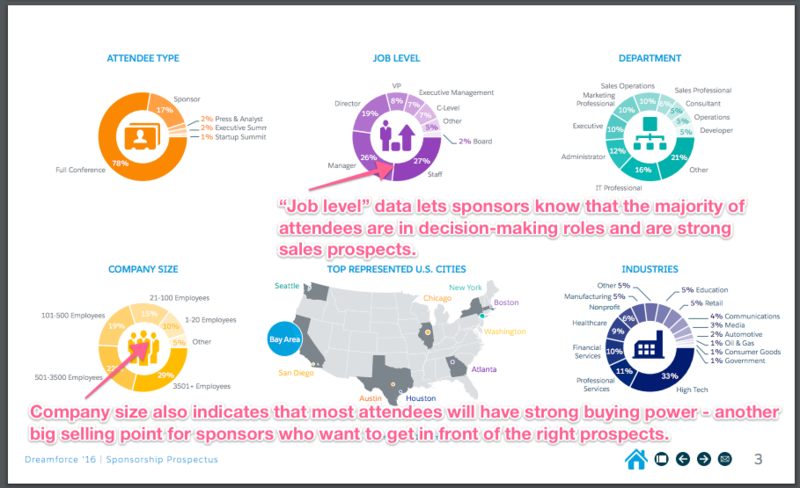 This is not only eye candy but it provides real insight for the sponsors who are evaluating the event to ensure that Dreamforce’s attendees align with their own target personas. 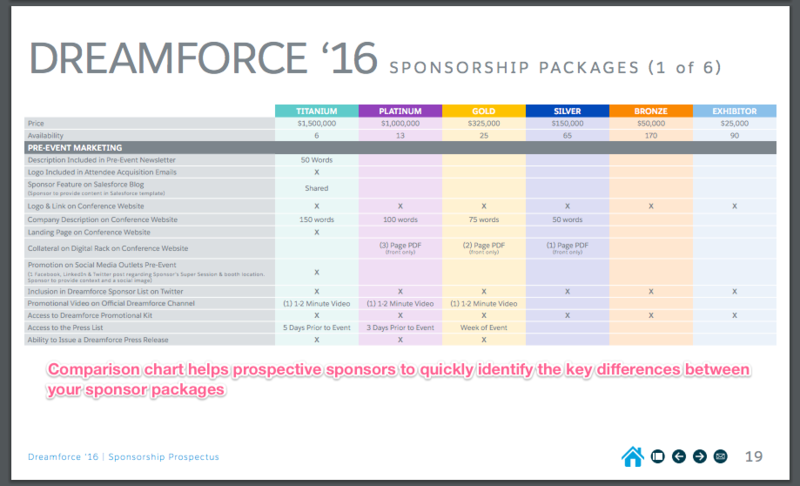 The way that Dreamforce’s organizers have presented this data is perfect because it makes it easy for their sponsors to digest. Starting with the highest dollar packages, the document outlines all of the sponsorship tiers available. Notice how explicitly clear it is what you get with each package — very black and white language and presented in a way that makes it easy to understand what each of the different sponsorship packages will get you. They also include testimonial quotes at each of the sponsorship levels from former sponsors at those levels. What better social proof point is there? They’ve gone ahead and made it super easy to compare the packages apples-to-apples with their comparison charts. 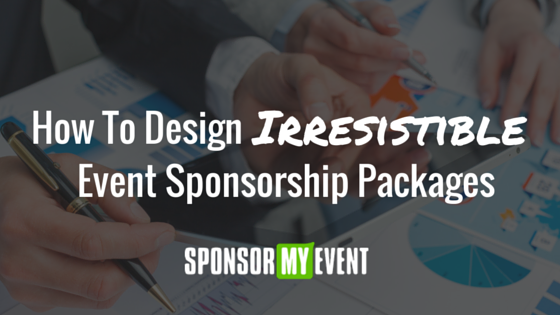 This is a smart way to upsell your sponsorship packages and allow your sponsors to customize your packages to their own needs at the same time. 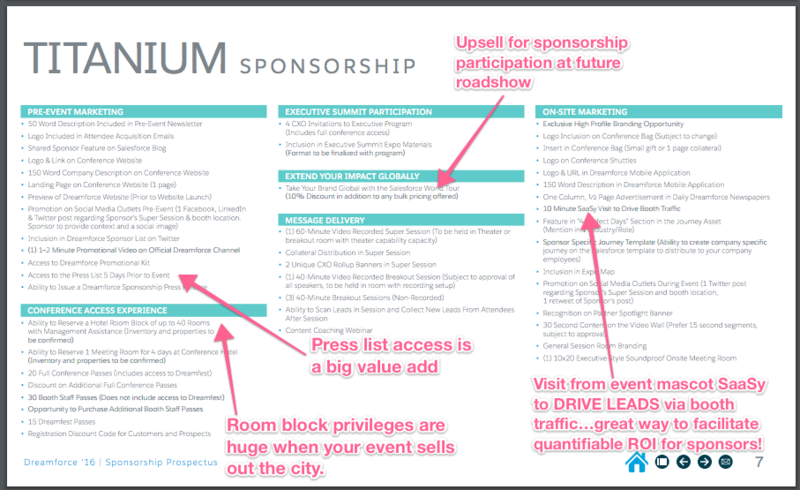 Items like conference bag pen drops, inclusion on the expo map, onsite meeting rooms, branded massage lounge or DJ stations are great ways to let sponsors choose what suits their objectives. On page 33, you’ll see a brief, illustrated timeline of the event organizing process. 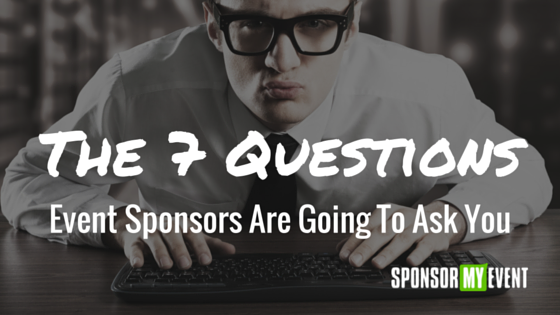 This provides visibility into what’s going on behind the scenes and what deadlines exist for sponsors. 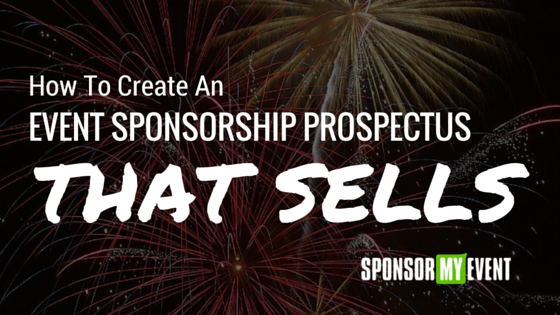 It also provides context so that prospective sponsors have a general idea of how scarce particular sponsorships could become should they choose to wait. 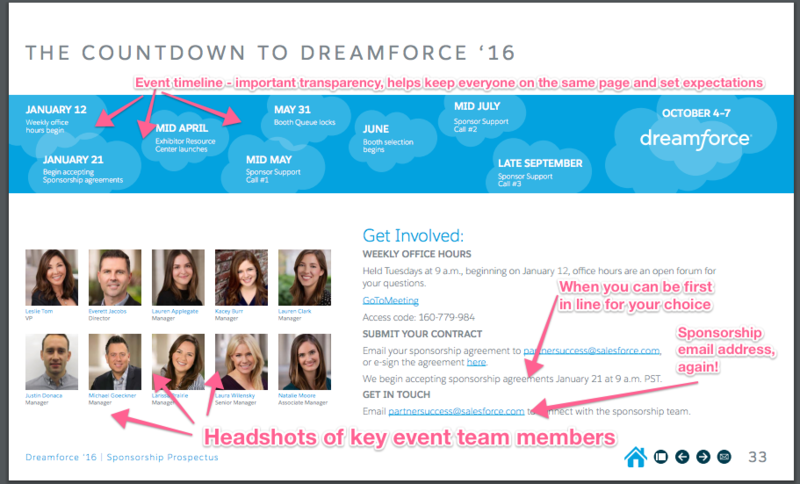 On the same page, you’ll also find headshots and role titles for key contacts — this is tremendously useful for sponsors who have a full calendar year of event marketing to manage. 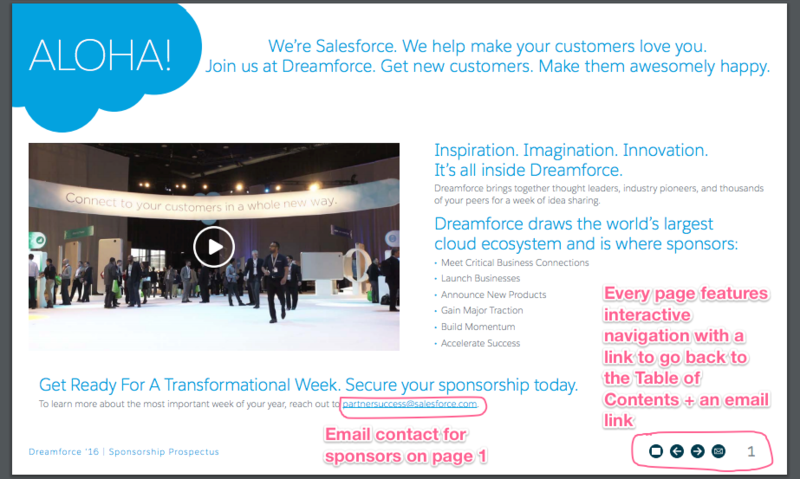 And once again, the sponsorship email address is highlighted. Steal it: Put serious time and effort into the research, content strategy and production of your event prospectus. It’s the last mile between you and closing a sponsorship deal for your event and as such, it’s absolutely critical that your prospectus document “nails the pitch” for you. 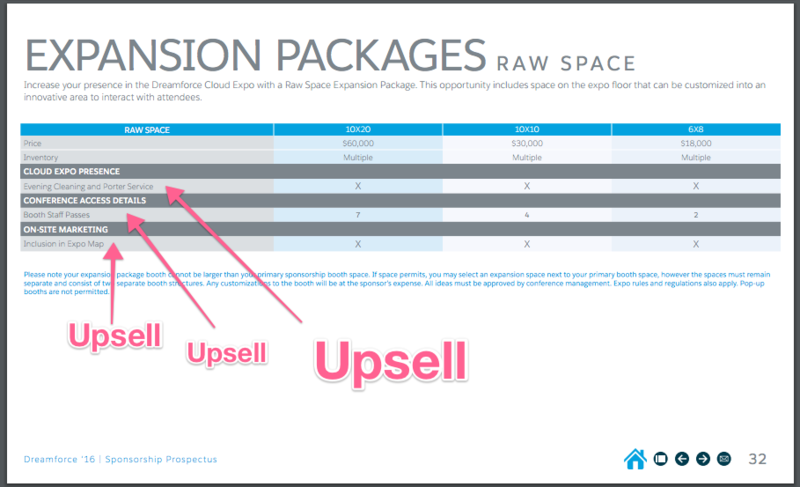 There are so many smart, well-thought elements to Salesforce’s Dreamforce prospectus that you can easily steal without costing you a single extra dollar of your budget. You can view the prospectus in full here.